polish fixation: Engagement Photo Shoot nails! 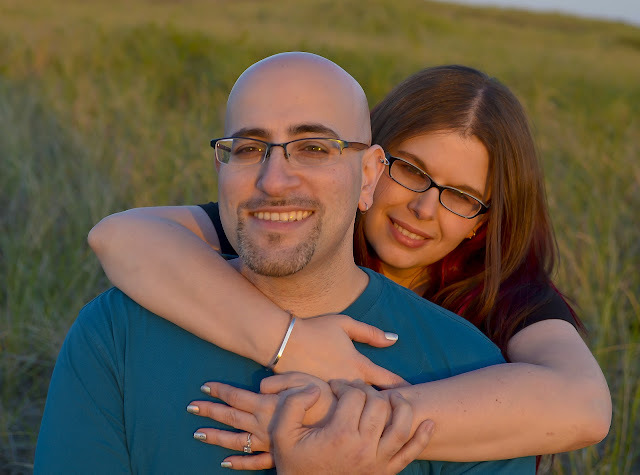 Recently my fiancee and I were offered the chance to get some photos taken of us together. We (somewhat reluctantly) decided to go for it because we really had no pictures of ourselves together that we liked. 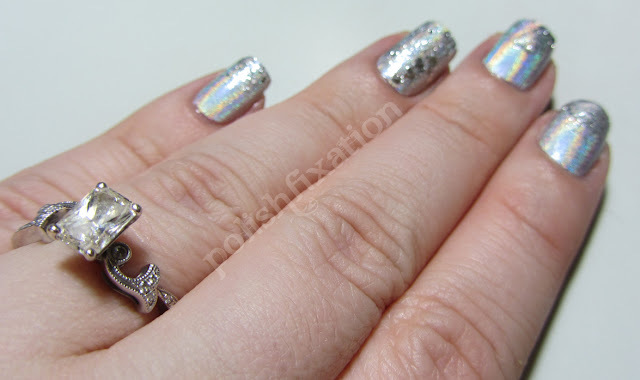 I couldn't decide how to do my nails for the pictures, but finally decided on holo and sparkly, similar to the nails I did when I announced my engagement back in November. 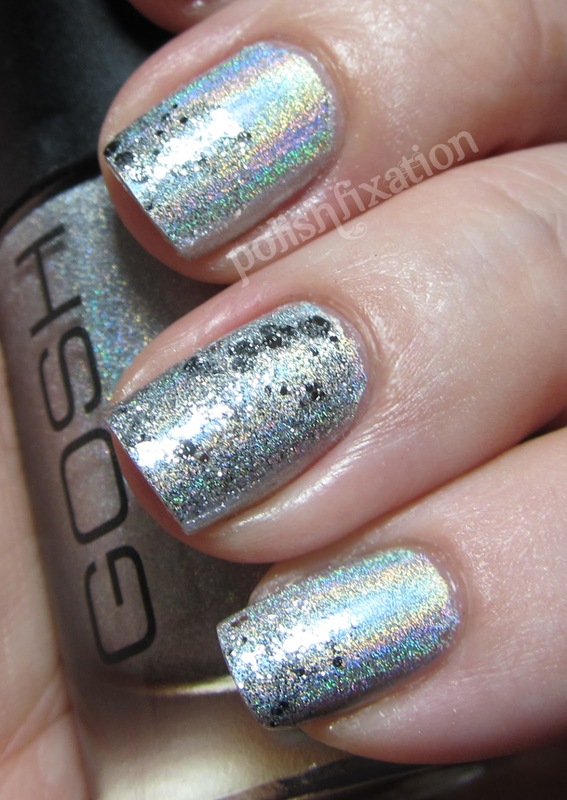 This time I used Gosh Holographic (again!) and then sponged a small amount of OPI Crown Me Already! onto the tips and onto the entire accent finger. In hindsight I think I would have gone for brighter nails or something a little more funky, but I still love this mani and don't regret it, you really can't go wrong with Gosh Holographic, ya know? And for fun, I will share a couple of pictures with you (warning, 1 pedi pic coming up to any feet haters! haha). I am really happy with the pictures! They were done by Jenny Coyle Photography ! What do you think of this mani & these pictures? Great mani! So pretty and simple. Your engagement picture looks great! that ring is gorgeous! i mean like...wow, one of the prettiest rings i've ever seen! - congrats! Super cute! I'm glad you two will have some great photos! I cannot wait until this fall when Gosh is supposed to release this silver holo again and hope that it's still the same formula as the first one. Love the gradient with the OPI here - the ONE glitter from OPI last yr I did not get and still lemming! I see it used more than any others from OPI 2011 in blogs. Cannot wait to see the wedding part of your set and assuming your engagement ring turns around to fit into the notches on this one. Mine is kind of a puzzle ring that fits the 2 together and I have never tired of it other than I wish it was with bigger stones - 3/4 ct was all we could afford at the time - actually all I would let him spend - he could afford more, but I was slim then (40 yrs ago) with tiny fingers too and the style was not for large stones then either...everyone was into a petite look because anything not looked like a cocktail ring and was 'not' the look for anyone not in the scene of being able to wear a cocktail ring! Best wishes to the both of you! Beautiful and I agree your ring is Gorgeous! Congrats on the engagement.